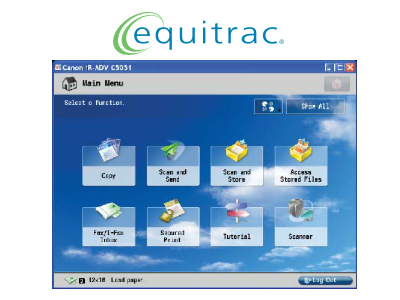 Found one file extension association related to Equitrac and 1 file format developed specifically for use with Equitrac. Equitrac intelligent print management software helps make printing work how you want it to: Simply, securely and with maximum savings every step of the way. One click for any print job – and any printer. No worries about print servers, compatible print drivers or whether the printer is ready. Complete accountability to better control costs and security. All of which equals a reduced burden on IT and a smaller hit on corporate budgets. If you need more information please contact the developers of Equitrac (Nuance Communications, Inc.), or check out their product website.